Red Lettering, a gay paranormal novella (aka my Japanese-Canadian drag queen ghost story), is part of MLR Press’s 2014 Halloween series, Scare This. Colin’s boyfriend Ren was flamboyant and fabulous, in or out of drag. Colin has been mourning him for seven years. When Colin walks into the local diner, he doesn’t expect to see Peter the flirty waiter dressed as a waitress. Colin wants to let Peter go, but somehow just can’t do it. It’s Halloween, the veil between the living and the dead is at its thinnest, and Ren still has a lot to say. Peter’s been hurt before, and Colin has truths of his own to face, but with Ren’s help, maybe they’ll have a shot at more than a one night stand. The sequel to Red Lettering, Black Shades is a Christmas Carol story featuring Peter’s point of view and Ren’s fabulous outfits. When Peter’s boyfriend’s dead drag queen lover shows up to reenact A Christmas Carol over the Christmas holiday, the life lessons will be hard, but at least the shoes are going to be absolutely fabulous. Colin and Peter haven’t quite made it to happily ever after. Peter’s been running for such a long time that his fight or flight response is automatic. He knows Colin wants to be his safe place to fall, but Peter’s terrified that eventually he’ll do and say the wrong thing to make Colin just like all the other men in his life. 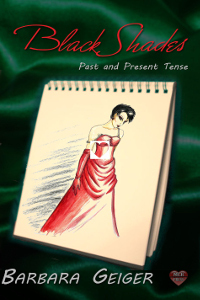 It takes Colin’s dead former lover, Ren, a fabulous drag queen, as the ghost of Christmas past, present and future to remind him where he came from, what he’s doing right now and who he really wants to be. This story takes place eight years before Red Lettering starts and is a crossover prequel with the Tempest Trilogy. Finn doesn’t know if all mythical shape-shifting seals are drawn to bright, shiny things, but it’s definitely one of his weaknesses. Something has been drawing him home to Victoria all week, but when he spots a flash of light on one of the islands off the BC coast, he realizes that what’s been calling him isn’t home at all. Ren has always known that he’s going to die young, and has lived his life accordingly with all the glamour and flair he can possibly cram in, both in and out of drag. He can feel the end coming near, but his grandmother once told him that when death was creeping up, to go to the beach and let his presence be known. The silver sequined gown that’s catching the light might not be his best dress, but it’s definitely his shiniest. Larger powers are at play than a lone selkie and a fabulous marine biologist could ever know, and a passing encounter may just be what they both need, for a glimpse of hope and a second chance before time runs out.